There are many options for smart light switch solution. 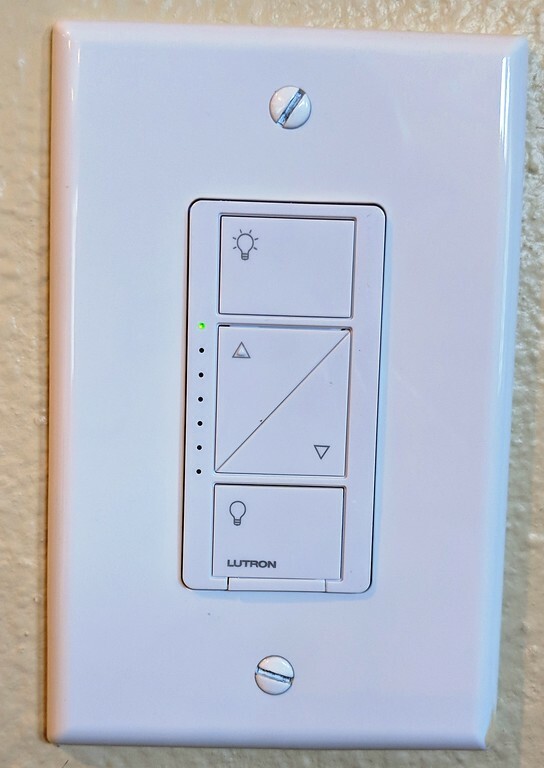 Dave picked the Lutron Caséta Wireless in-wall dimmer smart light switch for our home. Several things he looks for while researching, reliability, good quality, and multiple connecting & controlling options. 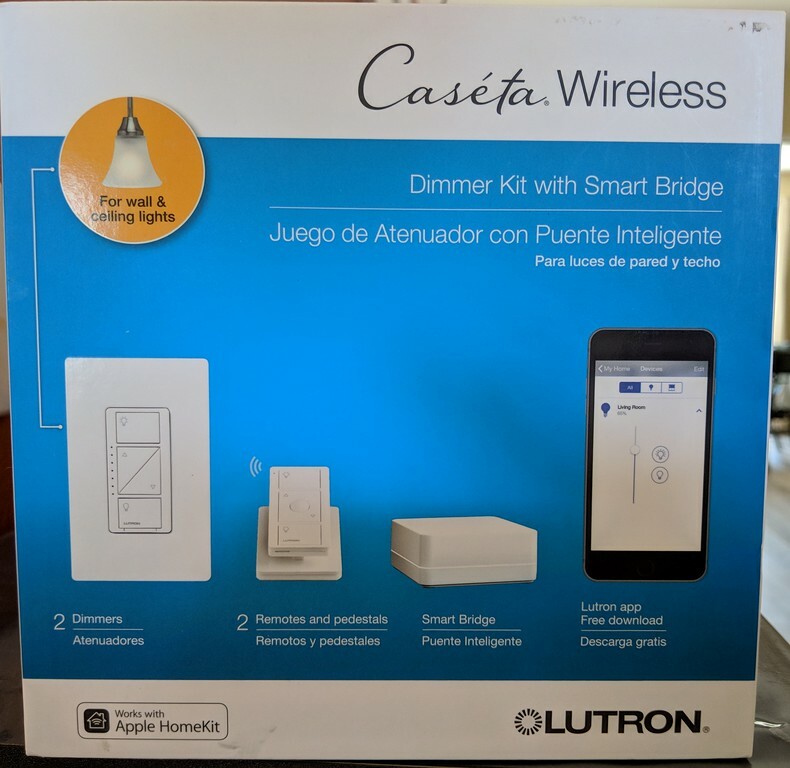 The Lutron Caséta Wireless in-wall dimmer smart light switch can be controlled through their app on any smart phone / devices. It is compatible with Google Home, Amazon Alexa, and Apple Homekit. So, controlling the lights can be as easy as a voice of command! This dimmer light switch works with any dim-able light, including LED. This project takes about an hour. Very easy installation. Ad Shop LED Light on Amazon! Ad Shop Smart Light Switch on Amazon! So, why a smart light switch? Well, one usage is so you don't have to get up from the couch to control the lighting using voice command feature. Another reason is the ability of controlling the light remotely. This is especially helpful when we need to double check if we turned off the light before leaving home. Also, the away mode is helpful when you want to have the light turn on and off automatically while you are not home. Another feature is the auto detection of your phone when you come home. The light would turn on automatically. That way, you don't have to find the switch! This project takes about an hour. Very easy installation. Here is a step by step video of the installation process of the smart light switch, also, set-up for the smart phone app. Dave's mother-in-law moved in a very nice place, but the faucets are old. What an opportunity to help out and make a video of it (his wife forced him to :D) All jokes aside, it wasn't a hard project but it took about 4 hours. The hard part was to get the old faucet out. The one we used is the water saving model - KOHLER K-R76216-4D-BN Rubicon Widespread Bathroom Sink Lavatory Faucet, Vibrant Brushed Nickel. Here are some tips for this project… When shopping for faucets, make sure to pick the one that fit the existing holes of the sink. The handles for the widespread ones are separated, the exact measure is not too crucial. However, for the center-set model, measure to match the existing holes of the sink. Another consideration if how far the faucet stick out to the sink, and how tall the faucet is. This is mostly personal preference. Depending on the type of sink, and how the water is filled, how far the faucet is to the bottom of the sink could mean how the water might splash. Tools that you want to have ready for this project includes crescent wrench, screw driver, adjustable pliers. In this video, you will see that Dave used a small hacksaw to cut the old faucet in order to remove it. The old faucet was too rusty, so he ended up cutting it to get it out. To remove soap scum, razor blade scraper and ajax powder would be helpful. Also, to seal the faucet to the sink, have some plumbers putty handy. Also, since the project requires going down underneath the sink, be careful with the back and the position when working on the project. Get the Plumber's pillow, that's good support for the back. While this could be done by one person, it definitely be better to have two people working on this project. In this video, Dave shows us detailed step-by-step instruction on how to remove the old faucet and installing the new Kohler widespread faucets.